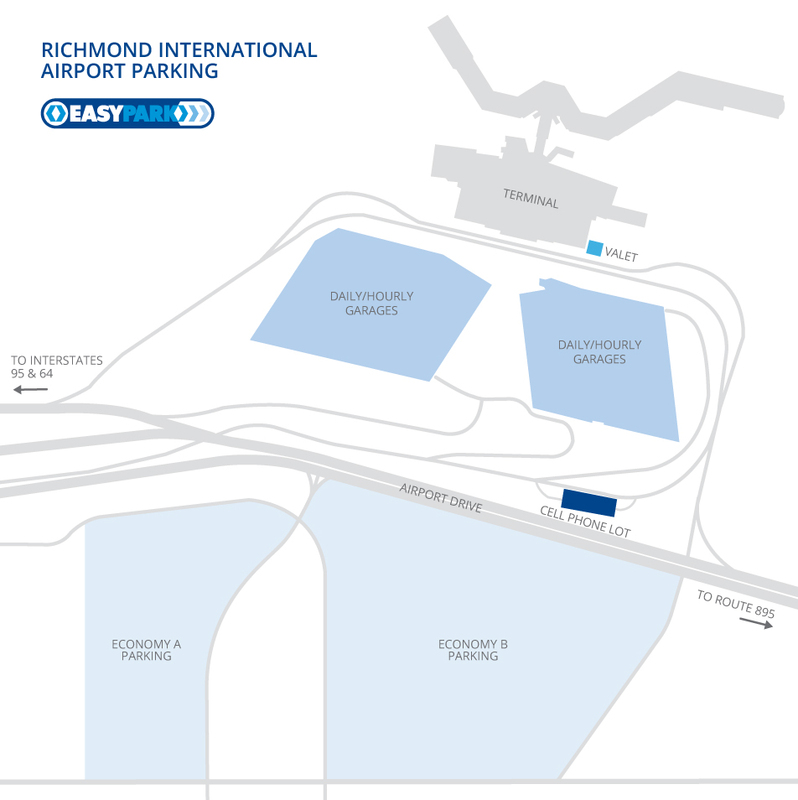 Parking at Richmond International Airport (RIC) can’t be beat in terms of value, safety, ease and convenience. We offer on-site lots and competitive rates to get you to your destination on time – and on budget! Questions? Contact Parking Services at 804-236-4030. Traveling for a few days? Get premium service without the premium price when you choose from our economy parking options at only $7 a day, with no hidden fees and no reservations required. Enjoy security and peace of mind at our gated on-site Economy Lots A and B, located within a half-mile of the terminal. Enjoy door-to-door service, courtesy of our complimentary EasyPark Shuttles, which run 24/7. Guaranteed. Economy Lots are located on Eubank Road, across from the Richmond Airport Hotel at 5501 Eubank Rd., Sandston, VA 23150. Complimentary EasyPark Shuttle service runs nonstop 24/7 and is wheelchair accessible. Call 804-236-4032 for additional shuttle information. Cashiers: Available 24 hours a day, 7 days a week. Credit Cards: Major credit cards are accepted at select lanes at all economy lot exits. AutoExpress: Take your parking ticket with you while you travel and pay in the airport when you land at RIC. You’ll enjoy a 30-minute amnesty period during which no additional charges will accrue, plus a speedy exit via express lanes at the parking plaza. AutoExpress pay stations are conveniently located throughout the upper and lower levels of the terminal and in the North and South parking garages. RIC offers nearly 7,000 surface and garage parking spaces for daily use. Our daily parking is located a few quick steps away from the terminal building and perfect for travelers who value proximity. Less than 60 minutes is free. Otherwise, normal rates apply. North and South Garages across the terminal. As you enter the airport, follow the signs to the Daily Parking entrance. Daily parking is available in the North and South parking garages, just a short walk from the terminal building. Credit Cards: Major credit cards are accepted at select lanes in the airport’s daily and hourly garage exit plaza. RIC offers parking spaces for hourly use on the first level of our parking garages. Hourly parking is a few quick steps away from the terminal building and perfect for picking up and dropping off travelers. As you enter the airport, follow the signs to the Hourly Parking entrance. Get pampered with RIC's friendly valet service. We'll park your vehicle for you upon departure and have it ready when you arrive! Follow the signs to Arrivals and look for the Valet Parking entrance just before the terminal. For added convenience, pre-arrange your valet parking service by calling 804-226-3089. Running a little early? Pick up your party without paying a parking fee by waiting at our Cell Phone Waiting Lot, located just off Terminal Drive near the main entry plaza. Pull up in this handy 40-space lot and wait for your passenger to call and say, "I'm curbside!" Vehicles must be attended at all times. Off Terminal Drive near the South Parking Garage and the main entry plaza. Follow the signs to Arrivals/Departures and look for the blue Cell Phone Waiting Lot signs. The Cell Phone Waiting Lot is FREE. RIC is ideally located in Central Virginia and attracts more than three million national and international travelers a year. The most convenient way to reach our location at Airport Drive is via I-64 (Exit 197A) or, alternatively, I-295 (Exit 31) or the Airport exit off of Route 895/Pocahontas Parkway. Try our Richmond International Google Map for specific directions from your location.